Has your dog shown fear during previous Fireworks displays? Has he/she shown any of the following signs when fireworks have occurred (even when you can’t hear them)? If so, it is likely that your dog has a fear of fireworks. A fear of fireworks in dogs is not uncommon. Let’s face it, why wouldn't they be scared of the noisy, bright, unpredictable lights. This fear can continue to escalate and get worse. 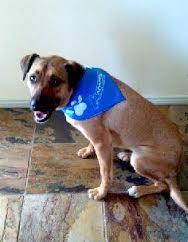 Unfortunately, your dog may escape your house/yard and is at danger or becoming lost, injured or even killed. Look ahead and prepare for fireworks early. In Brisbane, fireworks, will occur on events such as New Years Eve, Australia Day, Cracker Jack Carnival, Mt Gravatt Show, Pine Rivers Show, Ekka week, River Fire & Christmas in the Park, however I’m sure there are events that I have forgotten. Begin getting your dog used to the sounds (if you have time) using a recording and playing it at a low level that does not cause your dog to react. Start pairing the sound of the fireworks, with something your dog finds valuable (BBQ chicken usually works well), or play games and have pleasant interactions. If your dog is comfortable, slowly increase the level of the sound. Do not rush this, do this over a period of days to weeks. Always pair the sound with something the dog values. 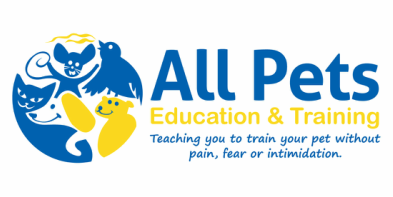 If your dog starts to show signs that they are uncomfortable, immediately reduce the volume and take your training back a few steps. No time! Fireworks are scheduled in the next few days? Do your best not to react to the fireworks yourself. If your dog sees you showing signs that you are concerned (remember dogs are great at reading body language), you may just make their fear worse. If your dog can be distracted with food or chews – give him/her a long lasting chew or food dispensing toy – chewing/licking releases endorphins and may help your dog settle. Close the blinds and curtains (be careful that any loose cords are removed or elevated so as not to be a strangulation risk for a panicked pooch). Keep the doors and windows closed. 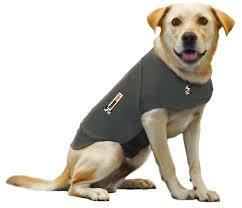 If need be use fans, air conditioning, or cool coats to keep your dog cool. If your dog wants to hide, let him/her. A crate trained dog may prefer to bunker down in a blanket covered crate. Never leave a choke collar on or tether your dog – during panic your dog may strangle themselves resulting in injury or death. 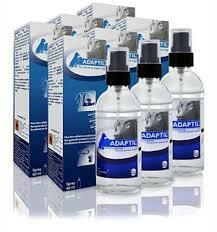 Zylkene - milk protein supplement - suitable for both cats and dogs. Ideally start 3 days prior to scheduled events. Safe to use with other medications. 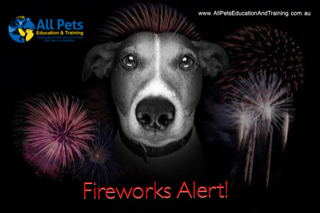 Talk to your Veterinarian about available treatment options – do this a few days before the scheduled fireworks event if possible – that way you can do a trial run with medication and your vet may be able to alter the dose if required. Avoid going out and leaving your dog unsupervised – if you must leave, have someone stay with your dog – direct supervision is important to prevent injury or escape. If the event that your dog does go missing, contact your local council, RSPCA, animal rescues, 24 hour vets, local veterinarians and local newspapers as soon as possible.